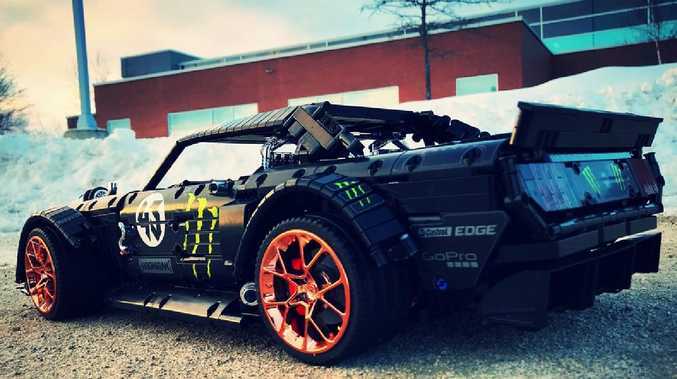 A lego model of the Ford Mustang driven by Ken Block in the YouTube hit Gymkhana. Picture: Lachlan Cameron on Flickr, Rebrickable. 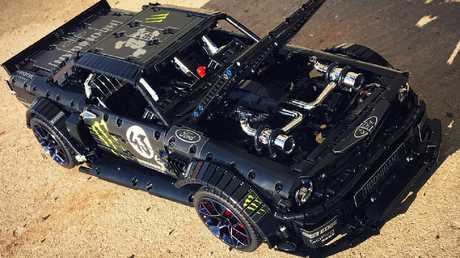 THE Ford Mustang driven spectacularly sideways by Ken Block in his legendary Gymkhana viral online video series can now be built at home as a drivable scale model. The model was created by Lego fan and car enthusiast Lachlan Cameron. Details of the build - claimed to take up to three months - have been published on ReBrickable, a Lego fan site for unique builds. The model of the Hoonicorn V2 Mustang - the updated turbocharged version that in real life made 1400 horsepower - is created using 2972 components. Enthusiasts have recreated the Mustang that stars in Ken Block’s Gymkhana series. Picture: Lachlan Cameron, Flickr and Rebrickable. All parts can be bought online using existing Lego components, including wheels created for the official Bugatti Chiron Lego kit. Various companies are assisting with unique additions, such as a soon-to-be-available sticker pack to ensure the finished product has the appropriate sponsorship and highlights. 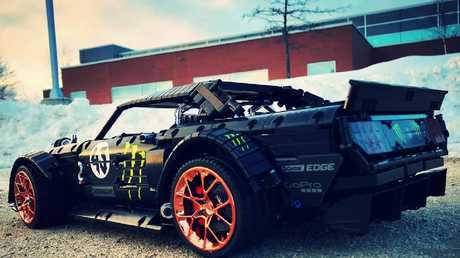 The Mustang Hoonicorn Lego car can be created as a rolling non-powered manual model or a fully electric version. There's even the choice of two electric motor brands, depending on your budget. They are controlled remotely using Wi-Fi and a smartphone app. Photo of Ford Mustang lego model created by Lachlan Cameron. Picture: Lachlan Cameron, Flickr and Rebrickable. 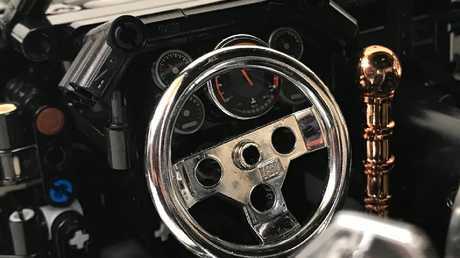 The model includes working inboard suspension, a turning steering wheel and working differentials. Clearly it won't make anything like the noise or tyre smoke of the real Hoonicorn Mustang, although that hasn't stopped the push for authenticity with the Lego model. Its V8 engine is visible beneath the opening bonnet and there are chromed turbochargers sitting on top. The creator is selling build instruction manuals for $40. Picture: Lachlan Cameron on Flickr, Rebrickable. The detailed photos and parts list also includes build instructions that can be purchased for £22.00 ($40) as part of the Premium My Own Creations lines published by the website. 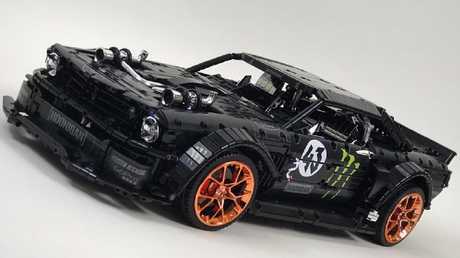 Early comments on the Rebrickable website suggest there could soon be plenty of Lego Hoonicorn Mustangs created. "Incredible … this is a must build," said one, with others adding "cool dude" and "love it". Still, at least it's more achievable - and enjoyable - than the various full-sized Lego cars created recently. The attention to detail continues into the cabin. Picture: Lachlan Cameron on Flickr, rebrickable. Earlier this year McLaren recreated its Senna using almost half a million Lego pieces. And in Australia Toyota produced a life-sized version of the Camry early in 2018.